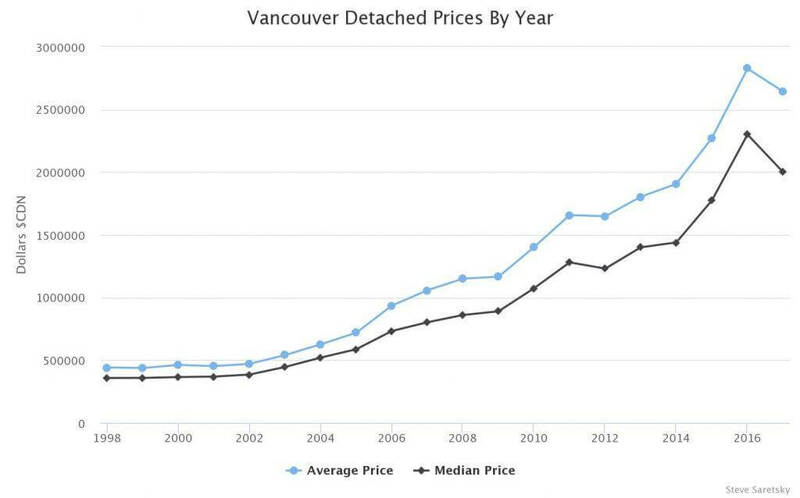 With the year 2017 coming to a close I’ve put together a compilation of stats summarizing the Vancouver Real Estate market. What you’ll find below are the average and median sales prices, dollar volumes, sales and new listings. These numbers are compiled using the full years worth of data. While these numbers won’t tell you where the market is at this exact point and time, it does provide an overall summary of the year and gives us a very good idea of the trends to follow heading into 2018. Keep in mind that most industry reports and media outlets use monthly statistics and then compare that particular month to the previous years month. This can cause for wild fluctuations, particularly when Governments are bringing in new policy measures rather frequently. The average sales price of a detached home fell 6.5% in 2017 from $2,825,000 to $2,642,000. The median sales price dropped 13% from $2,300,000 to $1,999,000. Again these metrics are not perfect, most of the price movements came from the higher end. But with a full years worth of data it’s clear the trend was down for the detached market. The dollar volume tracks the total amount spent on Real Estate purchases. 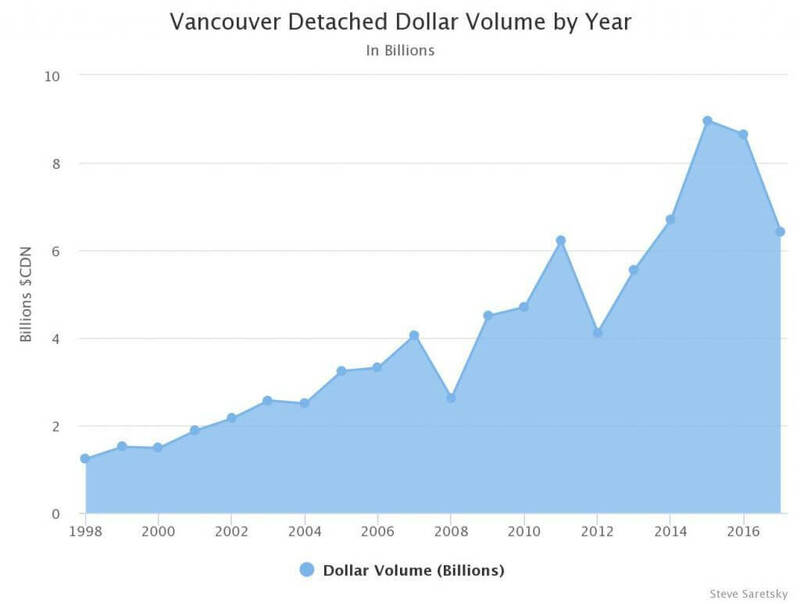 The dollar volume for the Vancouver detached market was $6.4B CDN in 2017, down from $8.6B in 2016 (a 25% decline), and even lower than the peak in 2015 at $8.9B. Detached sales plunged by 20% for the year. The 2434 sales for the year was the lowest total since 2008 and well off the peak in 2015. New Listings fell in 2017 by 9% to their lowest total since 2009. Sellers initially suppressed inventory in early 2017 but new listings returned to more normal levels as the year progressed. This will be an important stat to watch in 2018. 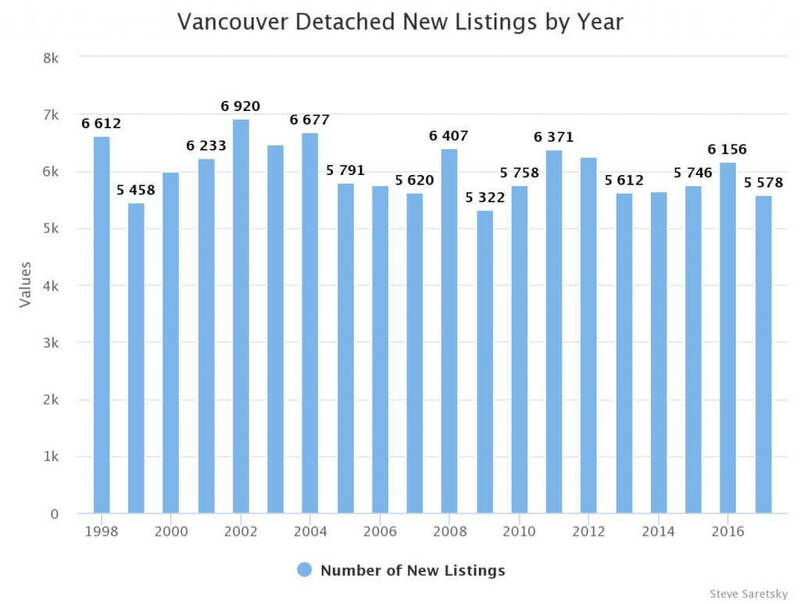 New Listings by year for Vancouver Detached Market. Despite new listings stuck at very low levels, inventory has still climbed substantially. 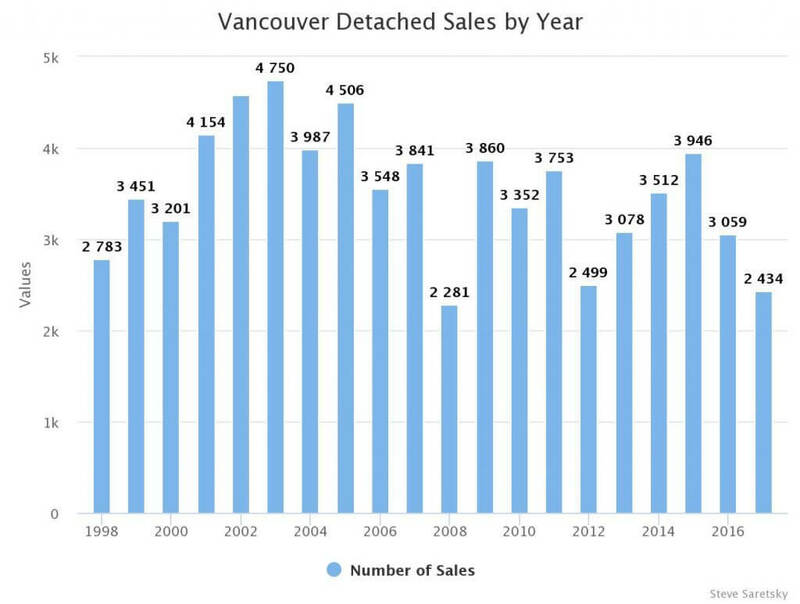 This is largely due to Vancouver detached sales weakening for nearly two full years now. Detached sales haven’t been this low since 2008. This has ultimately led to downwards pressure on prices and you can see that reflected in the average and median sales price. I’ll be very curious to see how a tightening of mortgage credit impacts detached sales in 2018. The average sales price of a Vancouver condo increased 13% in 2017 to $849,712. The median sales price increased to $695,000 which was an 18% increase for the year. Total dollar volumes increased in 2017 to $5.5B, up from $5.1B in 2016. 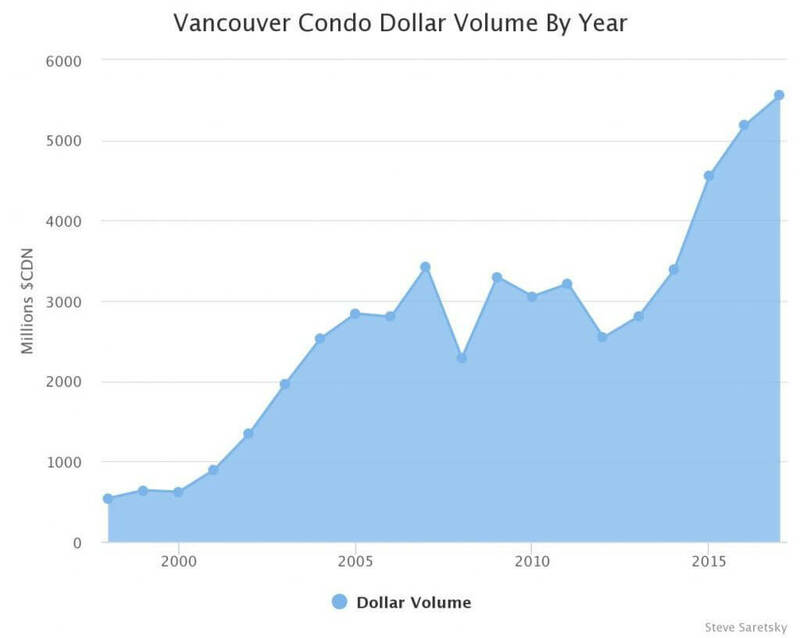 Dollar volumes in the condo market jumped by 7% overall. 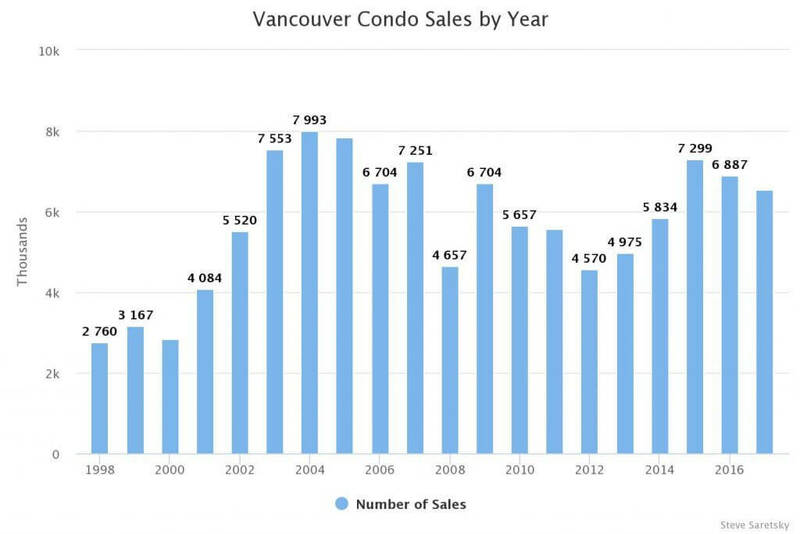 Vancouver condo sales fell by 5% year over year. There was a total of 6543 sales which was the lowest total since 2014 but still 10% above the ten year average. There was a total of 8626 new condo listings in 2017. That was a 3.5% drop on a year over year basis. 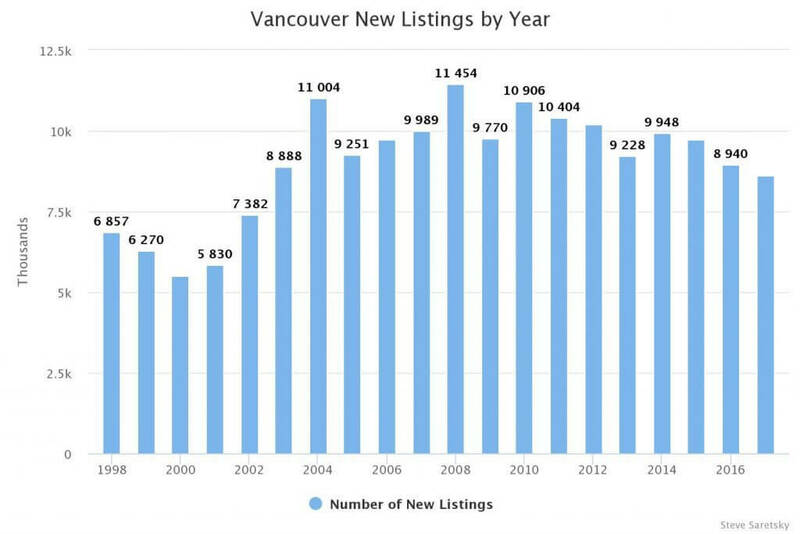 New listings haven’t been this low since the year 2002. This is a huge reason for record low inventory, nobody is selling as prices reach dizzying heights. 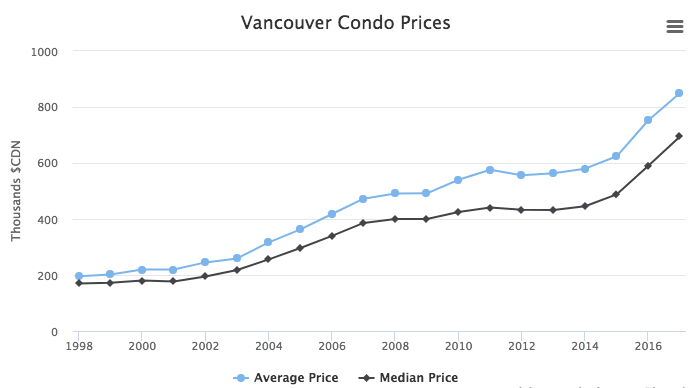 Vancouver condo new listings by year. The big story here is new listings and overall inventory levels. Both are near record low levels. Nobody wants to sell as prices reach new record highs each month. With 40,000 units under construction in Greater Vancouver I suspect this should help ease inventory constraints in 2018. I think the largest price increases are behind us but time will tell.